Whenever Summer comes round, I'm one of the first to be slathering on SPF. However, finding a good face SPF that doesn't make my skin itch and break out, or cause my makeup to go patchy is a bit of a struggle. 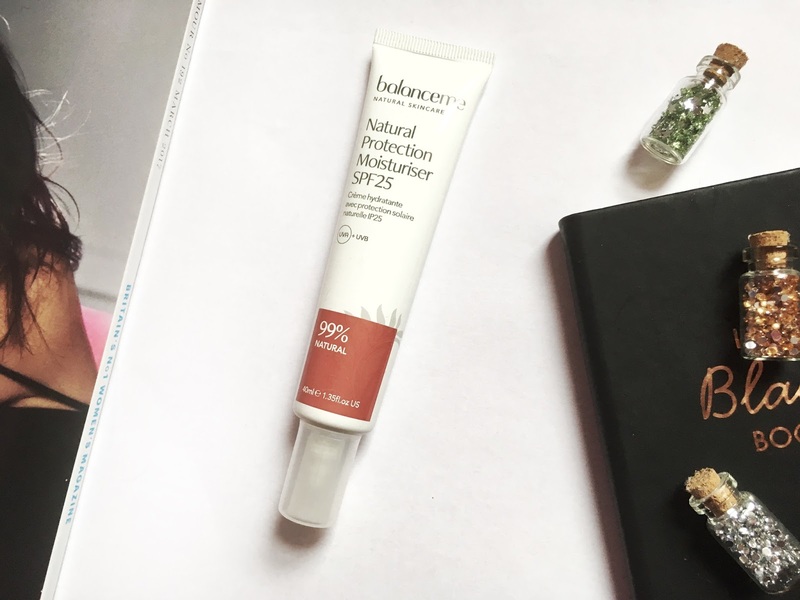 So I was really excited when I got the chance to try out the new Balance Me Natural Protection Moisturiser SPF25*, which claims to be an innovative natural sunscreen as opposed to the traditional chemical SPFs we're used to seeing. So how is it different to the traditional SPFs? First of all, it includes some key ingredients, such as hyaluronic acid (I think everyone knows the benefits of hyaluronic acid by now as it's been taking the beauty world by storm this last year, so I did rejoice a bit when I saw it included - if you didn't know, it's great for hydrating the skin and making it appear more plump), titanium dioxide (a physical filter to protect against UVA/UVB rays) and kukui seed oil (a natural silicone replacement that's great for moisturising the skin). But what is a physical filter? So when you buy a combined sunscreen in the shop (one that is both a moisturiser and SPF), there is a danger that you will not be getting enough protection. Many suncreams use chemical filters, however you have to wait for these to sink in, and they can sometimes lead to irritation on sensitive skin. Therefore, if you're using a combined suncream it's best to go for one that has physical and natural filters, either titanium/zinc oxide, as they offer immediate protection. Titanium/zinc oxide are minerals which act like reflectors, so they basically block the UV rays in the first place, rather than letting it be absorbed like chemical filters (which absorb the rays but stop it damaging the skin to an extent). You also need to look for a broad spectrum sunscreen which offers protection against UVB rays, which are associated with sunburn for example (this is what the SPF number relates to! So an SPF of 15 offers 93% protection against these rays, SPF 30 97% protection, and SPF 50 98% protection - not a huge difference like I imagined) and UVA rays, which penetrate deeper into the skin's dermis. The Balance Me SPF covers both of these. So with that done, I can honestly say I had no idea that there was a choice available between chemical and natural filters. I've also read that chemical filters can also play a part in pigmentation, and you all know how I'm on a journey to get rid of my hyperpigmentation, so I will definitely be making the switch to natural filters, where possible. They are also supposed to be a better option for sensitive skin, rather than chemical filters, hence why I think my skin got on so much better with this SPF. So onto my thoughts now! 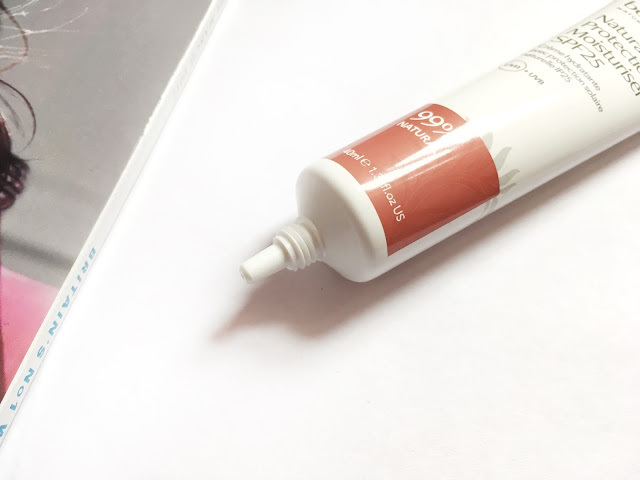 The Balance Me Natural Protection Moisturiser SPF 25* is marketed as a super light daily moisturiser, and due to the emphasis on natural ingredients it should protect you from the sun and environmental damage, all without leaving you with a white cast. When I first tried it out, it was actually thicker than I expected it to be. Not as thick as say the Nivea SPFs, but thicker than your average moisturiser, so it did need to be massaged in. I didn't get a white cast per say, but it did leave my face looking a tiny bit more pale. However, after massaging it in and waiting a minute, it had fully absorbed like any other moisturiser. The thick feeling was also gone and my skin was back to it's normal shade. 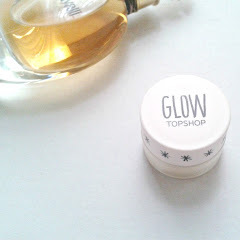 It did leave a bit of shine, again not as bad as other SPFs I've used, but noticeable around my cheekbones. Here's where I made a discovery though! Pairing it with the Body Shop Vitamin C Skin Reviver (a serum/primer in one) instantly mattifies it, and together they give a great base for makeup application. I use the SPF over my serum, and substitute it for my moisturiser. As for how it fared during the day, honestly for these past few weeks I couldn't even tell I had SPF on! My skin doesn't feel hot or itchy, like I have something sitting on it. My makeup hasn't gone patchy, my concealer hasn't broken up, there isn't much shine popping up through the day either (apart from the normal amount when it's a hot day). There's also no greasy residue at all, I wash it off with a hot cloth cleanser in the evening, and my skin's been absolutely fine! No breakouts (in the past I would get white pimples from certain face SPFs) or dry patches either. You get 40ml of product for £26, find it here on the Balance Me website, or at M&S/John Lewis. I will admit that it is on the pricey side, so it depends on what you want in an SPF. All of Balance Me's products are free from parabens, mineral oils, sulphates etc (including this), and they are cruelty free, so for a lot of people I think it will be worth the premium price for more natural skincare. You might also be happy paying more than drugstore prices for a natural, rather than chemical filter. 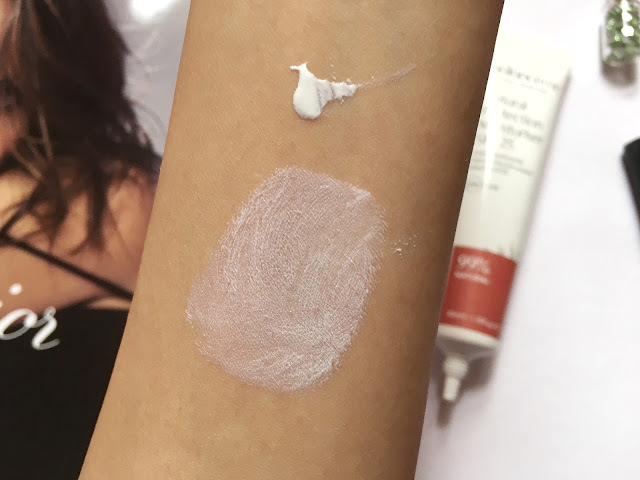 The SPF is also an update on a previous version so I would just double check the packaging, to ensure you pick up the right one. The packaging is a squeezy tube that comes presented in a box (as per the first image). It has a screw lid which is quite sturdy, and the small nib means that it remains relatively air tight (there's always that worry that SPFs can lose their power - so that's an added bonus). As for flashback, I did read that physical filters are more likely to cause flashback in photography as they reflect the sun's ray, but I did take some pictures with flash on and I didn't notice any flashback personally. Overall, I've been really impressed with the Balance Me Natural SPF*, and it's also got me thinking about the sunscreens I use too! My only criticism was going to be that I prefer having a higher SPF (due to pigmentation issues), however as I found out above a higher SPF doesn't offer a lot more really, so I'm more than happy with the SPF 25 as I know the physical filter will be blocking the rays from being absorbed into my skin. What do you think about natural versus chemical filters in SPFs? Would you make the switch? I never realised that you dont get enough protection from using the combined one. I hate that greasy feeling, it makes it feel like my face is melting! This looks like a great product, I'm all about trying to protect my skin at the moment (having not really done it properly). Currently using ultrasun face which is lovely, but will definitely give this a try - fab review! Thanks for this post lovely! Such a thorough review. I've not tried Balance Me products before, but I use an spf 30 in the summer. I meant to say also that I don't think I've tried anything from the Balance Me range before either. Great post i will be definitely trying this! That's really good that it worked so well for you! Thank you for sharing! Sounds like a great product! I always use SPF all year round! This as such a good read! i'm terrible for not wearing SPF on my face! I'm in need of a good face one for my holiday coming up so I may give this one a go! thank you for sharing love! Kukui seed oil, it's my first time seeing this ingredient, hmm. It's really hard to find a physical sunscreen without leaving me looking pale. I'd be putting this onto my wishlist right away if not for the price! This sounds like a really nice product! The ingredients list is pretty impressive. Thanks for the detailed review! 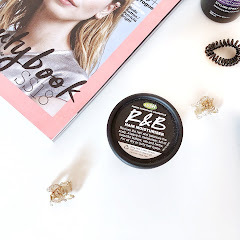 I've only used the balance me lip balms before so it's nice to hear about the skincare range as well! I use an SPF on my face everyday but I had no idea about the difference between chemical and physical filters - will be looking into that! Me neither, thanks for popping by! 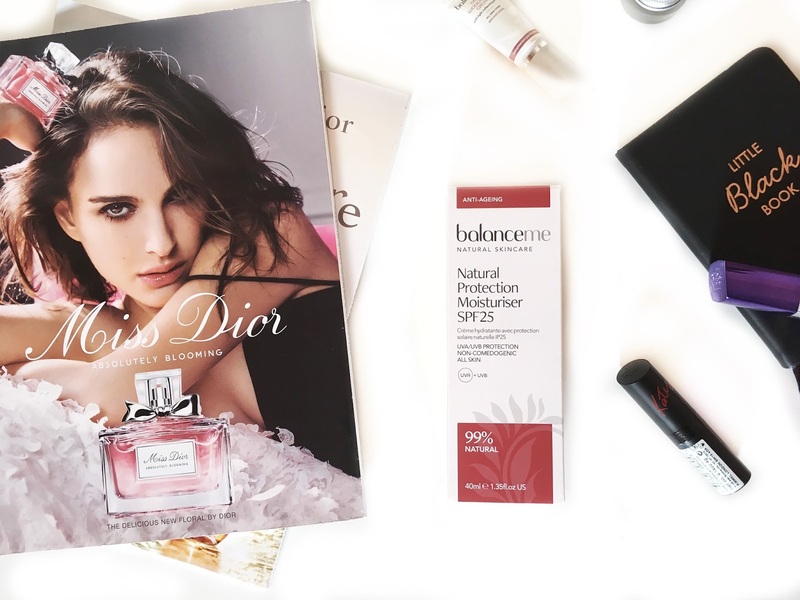 I love how you've explained the importance of applying SPF and what the difference between UVA & UVB rays are informing your readers before hand on the importance of protecting the skin and why. That said, this seems like such a great product! I'm glad that it's free of all the harmful ingredients found in most SPFs, I tend to use vegan products more because of this, though sometimes you don't get the best results, glad that's not the case with this one! Thanks for sharing, beauty, and I hope you have a great weekend ahead! This seems so lovely! I will defiantly consider this one when mine runs out. I have never heard of this line! I am all for SPF so I would be willing to do natural if it worked just as good. Thanks for the review! I am not too fuss between mineral and chemical sunscreens but I know some are very sensitive to chemical ones. This is a brand that I have seen and read about but never tried anything. SPF is something that I never really thought about until recently. 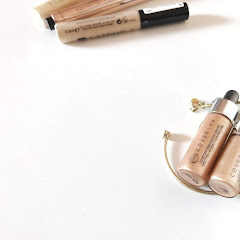 I've been using the SunBum Face Stick and love it! It smells like coconut and bananas. This product sounds really great too so I may have to give it a try! Oh! My friend recommended this to me (along with a lot more, haha) before, I might check it out soon :) Thanks for the detailed explanation, it really helps. I have to try out this product! While I do prefer moisturisers that absorb quickly, I reckon this one would definitely be worth it with the natural ingredients! I have to try this out!! Would definitely be interested in trying it out! All natural and with hyaluronic acid! I am in! My skin is so dry - I am going to give this one a go! I love how much information you put into this review! I don't know much about SPF, I only recently started using it regularly. Such a great post! Oh my gosh-- sunscreen is the one thing I really should be using more-- and I'm not. I'm so funny too because I hate getting tan! I'm also not such a fan of a low spf-- although it is true that after a certain amount of spf, it doesn't protect your skin more, the sf just stays on longer-- which can be a good thing too. Oh gosh-- I really need to put sunscreen on everyday. Thank you for guilting me. I needed that. Looks like an interesting product, love that its 99% natural! Thanks for this helpful review! I like it especially that this product has that high SPF - what personally is important for me. I definitely need to check out this sunscreen. I love products that focus on using natural ingredients, it's so much better for the skin. It's great that it doesn't leave your makeup oily or patchy at the end of the day, I have both those issues since I have combination skin! If you get enough protection from your spf is not dependend on physical or chemical sunscreen, but on the amount of product applied. Most people apply less moisturizer than they would (should?) sunscreen. I've tried this brand before and the product I sampled was gorgeous, worked soo well and I wanted a full sized version but never got round to buying it. This product looks fab! 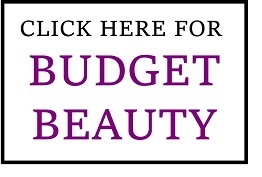 Are Beauty Gift Sets Worth It? 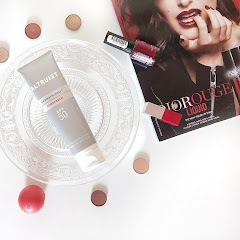 Recent Buys from Freedom, Body Shop and More!